On June 13th, 1913 in the southern territory of the Matara District in the village of Madihe, where the coconut palms sway and the ocean runs, a fortunate baby was born to parents of high esteem, J.C. Pujithagunawardena and Bella Anjela Dheerasekera. The father was a Christian and the mother a Buddhist and they named their son Wilmot – Wilmot Pujithagunawardena. This little child grew up in a home where he got the abundant love of his parents. When he got to be school age, he was admitted to St. Thomas’s Boys School, Matara. While in the classroom or at home or elsewhere, his mind circled around the thought of becoming a Buddha Putra, a bhikkhu. That was his only dream and atthe tender age of thirteen, his dream came true. His mother who was a noble lady realized the wish of her child. She did not stand in his way and neither did his father. She took him with a sheaf of betel to the great prelate Weragampita Sri Revatha Thera, the Chief Incumbent of the Kamburugamuwa Vihara and requested that the prelate ordain him as a Samanera. And so on June 24, 1926, he entered the Sasana and was named Madihe Pannghaseeha. 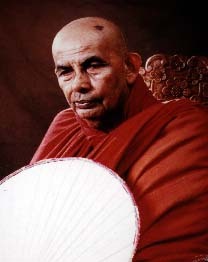 Venerable Revatha Thera was also the teacher of the Most Venerable Pelane Vajiragnana Thera. having learned all that a young bhikkhu could under Sri Revatha Thera, the young Samanera Ven. Pannghaseeha, came to the Vajirarama Temple at Bambalapitiya for further studies and mastery of the Dhamma Under Pelane Vajiragnana Thera. On the 9th day of June 1933 at Weligama in the vicinity of Pelane, Samanera Pannghaseeha received Upasampada, the Higher Ordination by his teacher, Pelane Vajiragnana Thera. During the very first days of his stay at Vajirarama, he had to undergo many hardships. There were no rooms as such, no beds and electricity was unheard of. He studied by candlelight. He went begging for alms in the morning with the other Bhikkhus and spent his spare time cleaning the surroundings and the temple. These are the beaming factors that lit his life and brought about his popularity. Those who entered the University at that time were learned Bhikhus and Ven. Madihe Pannghaseeha entered the University along with them. He Then set on the noble task of performing his duty to the country and the religion, and for the upliftment of Buddhism. In 1951, he set forth on a peace mission to Nepal and in 1954, participated in the Dhamma Sangayanava held in Burma. The Most Venerable Pelane Vajiragnana Thera passed away in 1955. With his passing, his seat became vacant and was filled by the Ven. Pannghaseeha Thera who was recommended for his cleverness, diligence, piety and high esteem. He was honoured with the title of Mahanayaka on November 27th, 1955 at Vajirarama at Bambalapitiya and was offered this title at the time of the Buddha Jayanthi. He then left the country accompanied by a band of laymen and Bhikkhu pilgrims to participate in the World Buddhist Congress on its fourth session. The Most Venerable Pelane Vajiragnana Thera, the great prelate who founded Vajirarama Temple at Bambalapitiya, had the great thought and wish to mold and train bhikkhus dedicated to service and the Dhamma there and abroad as Dhamma missionaries. This noble thought that arose in the mind of his master was realized by the Mahanayaka Thera. It was that noble thought that gave way for the great task of opening of the Bhikkhu Training Centre at Maharagama. On April 21, 1958 this long cherished dream came true and the Bhikkhu Training Centre was started in a humble rental dwelling. At present the Centre is located at an eleven acre picturesque property. It contains well equipped buildings where novice and student monks are trained for missions abroad and Provisions are made for the meditating monks. The main aim of this Bhikkhu Centre is to spread the Doctrine – the Dhamma far and wide. The devotees who observe Sil at the Center is enormous in number. exceeding 20,000. The bhikkhus who come to deliver Dhamma Desana are learned, pious and of high esteem and also the lay preachers are learned and disciplined. Renowned physicians in the country, surgeons, pediatricians, psychiatrists and medical consultants come to deliver these orations, which are of great value to the public. It is the Mahanayaka Thera – Ven. Madihe Pannghaseeha who deserves praise for all this and more than everything for moulding the Most Venerable Gangodawila Soma Thera for whom all Buddhists should be ever grateful. He taught the Buddhist masses especially the youth to observe and practise Pan Sil. Another great task performed by the Mahanayaka Thera was sending Dhamma missions abroad. Venerable Thera was instrumental in establishing Theravada Vihara in the United States of America with the untiring efforts of the Sasana Sevaka Samithiya and the then Prime Minister Hon. Dudley Senanayaka and also with the help of the Sri Lanka Embassy in Washington. In 1965 in a Flat in Howard the Temple was founded. Today it resides on 16th Street, a fully equipped temple in a beautiful surrounding on a picturesque setting in the vicinity of the “White House” giving the golden opportunity for the devout Buddhists in America to worship and pray. Words cannot simply say the great deeds performed by the Mahanayaka Thera. His leadership, correct advice and the correct guidance led to many virtuous programmes. The great Sil campaigns, The Asarana Sarana Sevaya, The Dharma Charika, The Campaign against use of alcohol. Simplicity was Ven. Thera’s hallmark. He Never looked for comforts. The simple life he lived bears testimony to this. He was soft spoken. Never did he utter a harsh word, never did he hurt any one. He could be reached by any one. He treated the haves and the have-nots alike. He did not fear, or favour. This tribute is in kindness to the prelate’s immense generosity, and loving kindness. May his journey in Samsara be smooth with no grief until you attain Nirvana, that ultimate bliss.